Are you ready for an addiction like no other? Can you say no when all you want to do is say yes? If not..you may want to turn away! One bite of this ‘Crack’ and before you know it, you’re literally staying up late to eat it, denying your cravings to all who love you and making excuses for your sticky fingers! YES~I’m warning you, this crack should be illegal! But it’s not! 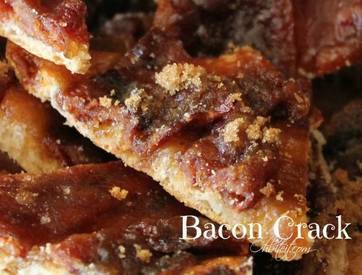 The allure starts even before it’s done cooking, The smell of that sweet bacon and buttery Crescent dough hypnotizes you, and before you know it you’re consuming every last flaky, bacon, sweet & spicy, chewy yet candied bite! This snack is like NO other!